1 Amp is more than enough current to kill a person. Thankfully the voltage is low so it shouldn't penetrate the skin. Don't be dumb and work with it while wet or jam it into your body. Thin non-clamped metal + Powerful drill = Spinning razor blade of death. Seriously clamp it down before drilling or the drill(Especially with larger bits) will grab it and spin it around. Same goes for small pieces of wood, although they aren't nearly as dangerous. This is from experience. Solenoids can get hot enough to partially melt themselves! Do not leave intermittent duty ones on, or repeatedly pump them. Also don't put them near anything flammable. Strip the ends of your speaker wire, and then solder it onto the solenoid's leads. Secure with electrical tape. Strip the ends of your power supply and solder on the speaker wire. Secure with electrical tape. Next cut a block of wood. It should be big enough to put your solenoid onto, but not much bigger. Drill a large hole near the top, where you want the piston of the solenoid to stop. This should be big enough for your machine screw to fit completely through(Including the head). Put the machine screw on the solenoid loosely. Now put in the piston(You will probably have to loosen the machine screw). To tighten the machine screw, hold the tip of the thread with pliers and rotate the hex nut(Hand tight should be fine). You have to do this since you can't reach the back of the screw anymore. First take apart the door knob in question. There should be three parts the inside handle, outside handle, and latch. Also 4 screws, 2 for the latch and 2 for the knob. We won't be needing the the inside door knob so store it away. Put the front and the latch back in place. 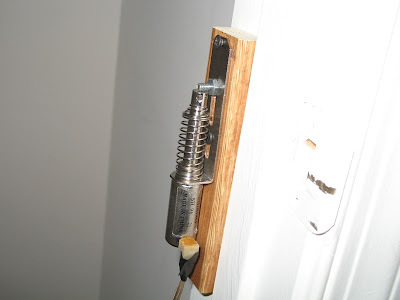 Take the scrap metal and bend it so it is across the doorknob hole and where the latch is. Mark where the 4 screw holes are. Drill out the 4 holes, then screw on the plate to the door. Remember to clamp it down since it can easily spin around and cut you. Next we need to figure out where to mount the eye screw. I found it easiest to put it on the solenoid piston, then go in and shut the closet(With the flashlight and a pencil) and then mark where the eye beam would hit the metal. Take back off the metal and drill the new hole. Put in the eye screw and lock it down with the bolts and lock washers. If you are like me and don't have lock washers, or just want to make sure it stays you can use epoxy instead. Get inside the closet again to make any final adjustments so it will latch properly when shut. After that you are finished. 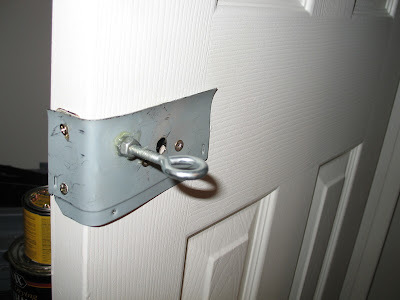 Simply hit On to open or close the door and Off to relock it. Would it be bad if I used a different type of washer? Or are the lock washers necessary? I don't have any but I have everything else at my house. Also, where would be the best place to purchase them? The lock washers aren't 100% necessary. They just keep everything from coming loose if it's jostled too much. Epoxy or even hot glue would probably work just fine. You can get pretty much any sort of washer at any home improvement store (i.e. Home Depot or Lowes if you are in the U.S.). Definitely possible to make it go faster, but a little more work (Mosfets instead of EM relays). Also easiest way to do multiple would just be a multi-wireless outlet setup. They are like $20 on Amazon for 3.